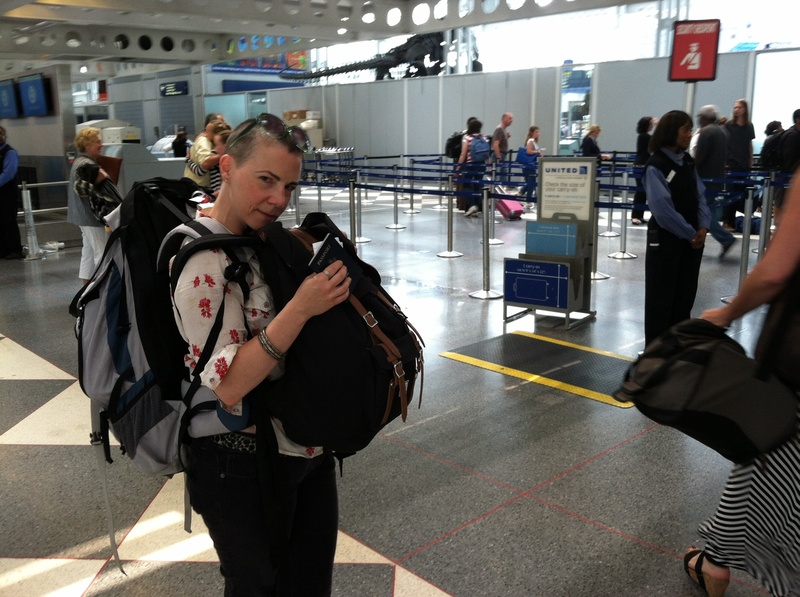 With heavy bags and a heavy heart, saying goodbye at the airport. I’ve begun this blog what feels like a hundred times. But each time, somewhere along the way, I’ve gotten stuck. Stuck between here and there. Stuck between Chicago and Madrid. Stuck between continuing to tell my story and just living it — holding something and someone so tender, so intimate, so close to myself. Private. And yet, it is all part of the story of how I arrived here. January 2015. I make the decision to move to Madrid. To become certified in Teaching English as a Foreign Language and to stay on for a year with a student visa. Turns out, I’m not…because I did meet someone, in March, at a memorial for a friend’s mother. But he didn’t reach out to me until a month later –the day after I bought my plane ticket to Madrid. The synchronicity isn’t lost on either of us. And so, while our three months together prove to be a great love affair for both of us, it is never in question that I will get on the plane on July 28. It is already written. We stand at the airport — kissing, crying, holding on to one another, saying goodbye. Watching and waving until I am barely visible in the TSA line. He gives me a final wave, puts his hands into namaste, blows a kiss and leaves — tears streaming down my face. Tears streaming down my face as I write this now. It is R. — a friend of a friend who takes me to the ex-pat bookstore, gives me a tour of his neighborhood and meets me the following day when I have a communication breakdown (and emotional meltdown) with Orange Mobil. It is M. — another friend of a friend who meets me for a walk and pinchos (snacks) on the plaza in her neighborhood. 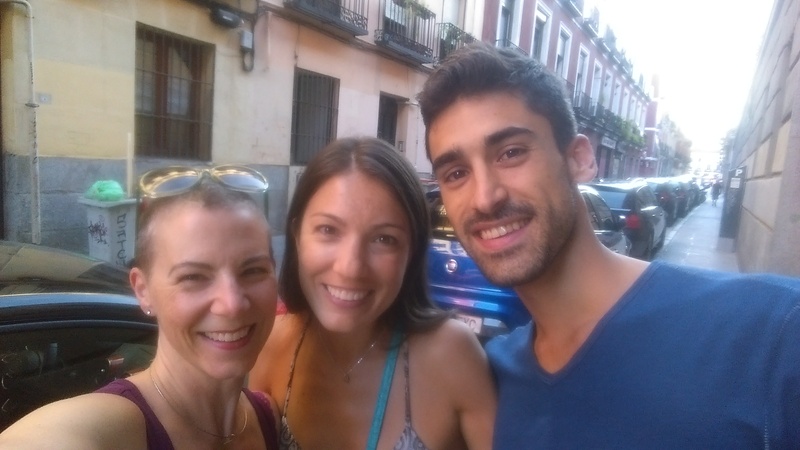 In Madrid, where new friends were waiting. It is N., M. and E — women from my online writing group who live here, two Americans and a Brit, who offer to meet with me, as well as J. — the best friend of one of my Weight Watchers members who calls me several times and invites me to meet for lunch next Sunday. It is the countless others who touch my life, if only for a moment, helping me to feel at home. My host, M., and flatmate, S., who builds the fan I purchase at Corte Ingles. J., another customer at the Correos — Spanish Post Office — who helps translate for me. And the four women workers there who see me three days in a row, and who help me finally secure a box for letters — handwritten notes with lovely stamps as was suggested by the man who said “Hasta luego” at the airport — because, yes, we are just that romantic. “Hasta luego” — see you later, but not “adios,” — goodbye. Mere nuance, the difference recently explained to me. A subtlety that allowed me to leave in spite of love and to remain available to open arms waiting— in Chicago, in Madrid — everywhere.